“Muliebrity” is coordinate term to “virility,” referring to qualities of femininity. Southwestern College staff, faculty, and students were invited to explore how they connect with and empower the feminine aspects of the self, community, or greater collective via artistic processes. The Wild Heart Gallery proudly presented a series of artist statements from this exhibition, which ran from November, 2016 through January 2017. I created this piece over a year ago but now that we are in the Chinese Zodiac’s Year of the Monkey it seems fitting to title my previously untitled drawing, Year of the Monkey. What’s more celebratory for me is that I am a Monkey, rather, I was born in 1980, which was also the Year of the Monkey. While I am no expert on the Chinese Zodiac, I will say that I relate to and aspire to cultivate Monkey’s playful, energetic, curious and collectivist nature. I also feel challenged as I persevere with the work of training aspects of my monkey mind which has been accustomed to swinging from the trees. While I have been an artist since I was a child, over the last three years my work has tremendously matured because of my intense interest in the healing arts and how I can create my own physical, emotional and spiritual healing through art-making and story telling. Both the baby and the mommy monkey are aspects of me and my exploration of the concepts of re-parenting myself, attachment, transcendence of traumatic relationships, and the cessation of addictive patterns which cause me to suffer. This piece is also an expression of gratitude. I feel so grateful for the Multiversal intelligent, cooperative design which inter-connects all beings and tethers us to the Creator and to Mother Earth. I also celebrate my own homo sapien mother, as our experience has been my most satisfying familial relationship. We are so blessed because our relationship continues to heal and expand in loving, exciting directions. Finally, this piece, along with many others in my growing body of work, represent an effort to heal my relationship with food and the hooks of Lifelong eating disorders. Immersing myself in the converging healing narratives which culminate and channel through expressive art-making and identity restoration, in conjunction with a high raw vegan fruitarian Lifestyle, empowering movement, and spiritual practices, serve as an integrative healing process which facilitates the embodiment of my own personal renaissance, springtime and rebirth. 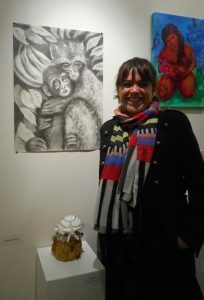 Year of the Monkey is an intentionally rendered space created with the goal of increasing my own capacity for and ability to co-create joy, safety, intimacy, softness, forgiveness, love, and lot’s of divine sweetness and freshness in relationship with myself and my community.